Wootz! 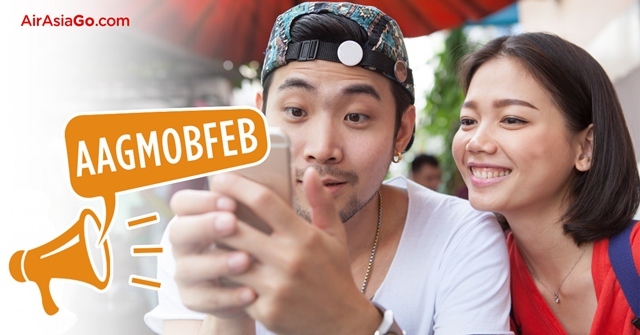 opt for more fun and affordable travels with AirAsiaGo.com mobile app Malaysia’s No.1 travel portal’s Mid-Month Madness. The very first Mid-Month Madness begins this 13th to 19th February for travel between 14th February and 30th April 2017 where you can enjoy an additional 10% discount on top of the daily mobile exclusive deals on flights only or even standalone hotel bookings. Just type in the promo code << AAGMOBFEB >>. With daily mobile exclusive deals going up to 75% off, imagine getting even more discounts on top of this during the Mid-Month Madness. There are over 510,000 hotel options to choose from and you can even choose to buy your flights first and hotels later during the Mid-Month Madness period. With AirAsiaGo.com Mobile App, travel doesn’t need to be just an annual affair. It epitomizes affordable and convenient travel bookings and is especially helpful for last minute bookings. For regular travellers following a routine, be sure to look out for the AAG Mid-Month Madness Promo Code on AirAsiaGo.com’s Facebook to save more than you ever have before. The AirAsiaGo Mobile App is available for download on Google Play or the App store and enjoy ‘RealTime’ itineraries with notifications whenever you make flight or hotel bookings. Oh deal, so many travel deals. I need more time to save more money, though!!! Argh... the woes of a working person. Now also got 20% discount lo. The sales is for all route I guess.